"I love the complexity of The Reality is Murder! I think it keeps things interesting, and no one ever feels bored during the night. I also love all of the surprises and reveals at the end of the night. I had a great time, and I know the other 32 people did too!! Would definitely consider using Freeform if I ever host another murder mystery party." "We hosted The Reality is Murder this past Saturday night and everyone (all 30 characters!!) seemed to have a blast!" 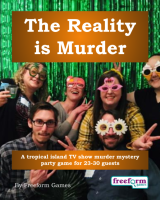 The Reality is Murder is a dinner party murder mystery game for 23 to 30 guests and one or two hosts – download the free introductory pdf file. NEW RELEASE! – be one of the first to play our new game The Reality is Murder. Join us in an exciting evening of reality television and murder You will be in the middle of the action and it will be up to you to wheel and deal with the other guests. Can you achieve your goals, keep your secrets hidden and survive The Reality is Murder? It's up to you. It is 2003 and Tribal is Network 123's reality show where 12 people live on Moko Shanti, a beautiful tropical island for up to 40 days. Every few days, contestants vote each other off the island during Tribal Meetings. Now, only three contestants are left, and tonight is Tribal's finale. Tonight, everyone has returned to the beach where the final Tribal Meeting will be broadcast live and the winner of the $1,000,000 prize will be decided. Unfortunately, all is not well. Jeff Thompson, Tribal's creator and director, has been found dead on the beach – a machete embedded in his chest… Find out who killed Jeff Thompson in The Reality is Murder. The Reality is Murder lasts for about four hours and is suited to an evening. It is often played over a meal – a finger buffet if possible to allow guests to circulate and talk in private. "Overall, players (experienced and new) had a really good time." The free introductory pdf file contains an introduction to the game, a cast list of all the characters, and a copy of the The Islander – plus details of how to buy the game. Alex Johnson – Matthew Stuart-Fosterson's personal assistant. Bernie Fraser – A stay-at-home parent from New York. First to be eliminated, coming 12th. Bo Bo Hardensfield – TV chef and presenter of Tribal's spin-off show, Tribal Bites. Britney Thompson – Jeff Thompson's wife and Tribal's host. Chris Keller – Tribal's head of security. Cindy Perkins – A waitress from Miami, Florida and a finalist. Clara Stuart-Fosterson – Network 123's Finance Director, and Matthew's wife. Derek Lunesdale – A body builder from Detroit, coming 7th. Devon Warring – Unemployed, from Orlando. Mysteriously pulled out of the show, effectively coming 9th. Domino Mountford – An eccentric French contestant currently living in New York City, coming 11th. Dr Charlie Milahoff – Tribal's psychologist. Dr Georgie Palmer – Tribal's on-site doctor, an expert in tropical diseases and injuries. Harry Samson – A retired US Army veteran from Long Island. Most recently eliminated in Tribal, coming 4th. Honey Rider – Bikini model from LA. Jules McGee – A snake and insect expert, originally from Australia. Kelly Patterson – A model from New York City, coming 8th. Lou Breakmier – An aging mystic from San Francisco, coming 5th. Mary Newby – Production assistant and Rex's wife. Matthew Stuart-Fosterson IV – CEO of the TV Network 123. Mike Hollandale – A real estate agent from LA and a finalist. Murray Neilson – Originally a park warden from the Florida Everglades, now an assistant producer. Phoenix – Leader of the Moko Shanti Islanders. PJ Deever – Tribal's primary camera operator. Rev. Hal Cleever – A minister from a small town in Texas, coming 10th. Rex Newby – One of the set designers, responsible for the creation of the Tribal Meeting set. Mary's husband. Ronnie Brooks – Ski instructor and mountain guide from Colorado, coming 6th. Sam Wraysford – Sam is Tribal's producer. Sandy Aikley – A lawyer from Chicago and a finalist. Skua – Phoenix's headstrong son. The Reality is Murder is unlike many murder mystery games. Although the game starts with a murder, most of the characters have more important things to do than to investigate it. And the killing may not be over – it is unlikely that everyone will survive the remainder of the evening! The Reality is Murder is played just like a murder mystery game. You may be trying to solve the murder, but primarily you are (initially at least) concentrating on your own goals and objectives. Unlike most boxed murder mystery games, The Reality is Murder lets you decide how to achieve your goals and thwart your enemies. "Keep up the good work … no one makes scripts like yours." On the evening of the game the guests are met by the organizer, the Events Manager, and welcomed to Moko Shanti. They then receive their detailed backgrounds – including dark secrets, objectives and money. The fun then begins as they form alliances, blackmail each other, steal items and maybe even try to murder one another! Along the way they may uncover some of the mysteries of The Reality is Murder. Who will win Tribal? Who are ANTHRO? And of course, how did Jeff Thompson die? Depending on what the players choose to do, there are several different possible endings, but finally everyone finds out how they did, and what secrets everyone else was concealing. The Reality is Murder costs £30.00 (GB pounds) or US $49.99. You can buy it in either currency, from anywhere in the world, as you prefer. The price will be converted back into your own currency for you, at today's exchange rate. We offer a Cast Iron Guarantee on all our murder mystery games. If you're not completely satisfied with The Reality is Murder then please let us know within 30 days and we will refund you. See our full terms and conditions here.